Do you know how hard it is to be a student at high school? Pretty hard. The teachers expect you to remember the smallest details of crap you couldn't really care less about. You write all of these notes down, and then like ten months after you've learnt about it, you have to go back to these notes. And try to remember them, all over again. Which is pretty impossible if you are as unmotivated as me. Because, I don't know about you, but it's really hard to sit down and memerise every rule there is in algebra. 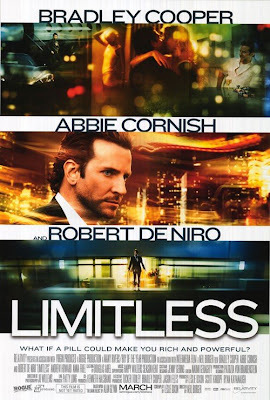 To make life even harder, though, Limitless was released. This film features every student's, or maybe everybody on this Earth's biggest dream: a pill that can allow you to use your brain to it's full potential. As the title suggests, this pill gives you the power to live without limits. The guy who gives it a test drive so we can all wallow in jealousy? Eddie Morra (Bradley Cooper). He used to be a hobo-lookalike writer who was suffering from a chronic case of evil writer's block. But he manages to catch up with ex brother-in-law Vernon (Johnny Whitworth), who just so happens to be a drug dealer. Vernon gives Eddie the key to getting over the writer's block: a pill called NZT. Eddie takes the pill, and at once he is addicted. His book is written. He suddenly knows how to get lots of money in the stockmarket. He can speak Italian fluently. He's got his girlfriend Lindy (Abbie Cornish) back. He catches the eye of business mogul Carl van Loon (Robert De Niro). Life's good for Eddie. Perhaps too good to be true. This film raises a very important question: how many of us know what it's like to become the perfect version of ourselves? But more importantly, it asks, what would people do if they became the perfect version of themselves? Eddie takes a vote from all of us: he goes wild with his powers. He uses them to their absolute advantages. He opens himself up to a world filled with lots of potential, which is really fun to watch. The problem is, however, the fact that this movie is exactly like the drug. It's damn fast-paced, it's as rushed as anything, and ultimately, it is filled with potential but it just doesn't know what to do with it all. This film has a really good premise, which is used pretty well for the most part, but it fizzles out fairly quickly. It also keeps swapping and changing its ideas at a rapid place, which gives it a fairly uneven tone. The final act, however, is the one that lets it down the most. I thought it was pretty slow compared to what the rest of the film had built up, and I didn't think it fit in properly. Mind you, the film was heading in the right direction by that point. In saying that, while this film is plagued with flaws, this is one hell of an enjoyable film. Thanks to it's fast pace, I didn't get tired of the film and it remained completely interesting for the entire time. The one thing that makes it a cut above any of the other movies I've seen this year is the brilliant direction and editing. Neil Burger wants you to feel like you are on NZT too. He uses different graphics to show the pill working inside Eddie, along with quick editing to show the pace in which Eddie is working at. Burger really involves the audience into the film, which is admittedly a really hard thing to do with such an out-of-this-world premise. Along with that, he has the modern kind of direction which I really like...the one that is backed by an awesome soundtrack and incorporates odd camera angles and plenty of editing. I know it will never get the accolades that it deserves, but Neil Burger's direction of this film truly is excellent. Another strong point in Limitless is the leading performance from Bradley Cooper. 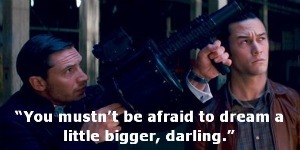 Many people have doubted his acting abilities before, mainly due to the amount of crap he has starred in. But here, he is given the lead role which he doesn't have to share with anyone else (unlike his role in The Hangover). He is a great leading man, more than capable of holding the film up when the material starts to wear off. It was particularly intriguing to watch him stand up to Robert De Niro in quite a few scenes, because I'm sure that's not the easiest thing for an actor to do, but Cooper held his own. Speaking of De Niro, he was wasted in this movie. I expected his character to have an evil edge, but no dice. Abbie Cornish plays Cooper's love interest. She continues to impress me as an actress, even if she's let the quality of the films she makes slide a bit of late. 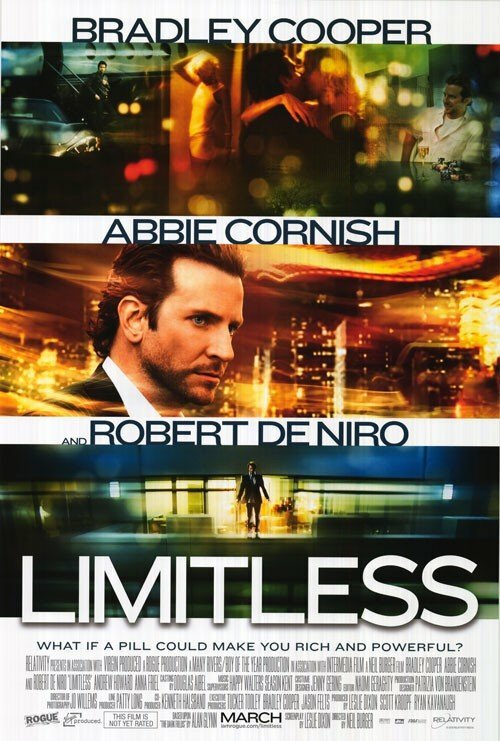 When it comes down to it, Limitless is a film that has a brilliant premise. It might not use it to it's full potential, but it's still enjoyable. It could have been better, but it could have been much worse. THE VERDICT: Brilliant direction and likeable lead Bradley Cooper are sure to keep you watching even when Limitless doesn't give you all that it could have. It's a fast-paced thriller, a cut above some of the ones that have come out recently. i think this is a perfect review of the movie. nice. Ugh, math...every little thing I forced myself to memorise in year twelve is gone...not that I need it anymore, haha. blah blah blah Toby - Awesome, thanks! Ruth - I didn't care much for the flaws! Oh, and Bradley Cooper is amazingly gorgeous. Cool review. The thing with Cooper's performance though, I think he isn't really acting here. He seems very much like his character in real life! So am still not so sure how far his talent actually goes. 5plitreel - Haha, oh well, he was a good leading man. I think he should try do some more serious stuff to see what he can do! Custard - Wow, that is pretty cool! I must get the DVD again to watch the extras!